Now that Thanksgiving has come and gone, we’re officially in that nebulous zone called “The Holidays.” For many, this includes hectic family gatherings, school programs, and travel to see relatives. College students return home to agitate parents and siblings. I officially boycotted Black Friday by purchasing nearly nothing, despite needing to pick up a new external hard drive. I was happy to see my municipality issuing tickets to big box retailers that opened at midnight, citing laws preventing 24-hour operation of retail enterprises. I’m not the neighborhood Grinch by any means, but I am glad to see someone countering the steady pressure of rampant consumerism. I did buy some coffee (a delightful peppermint mocha) while visiting with a friend, but I’m sure that didn’t make a blip on the Black Friday cash register. One good thing about The Holidays is that travel often brings people to town that I don’t get to see too often. I had the rare chance to sit down with my longest-standing friend. We started our healthcare careers together at the tender age of 13 as hospital volunteers, aka Candy Stripers. Cecilia always wanted to be a nurse and I always wanted to be a doctor, so it was a friendship forged of common interests with a sprinkling of adventure. We started volunteering on the mother/baby ward (yes, they were called wards back in the Cretaceous period,) refilling plastic pitchers with ice chips and answering the nurse call light system. My favorite part was using the Addressograph machine to stamp paperwork when new patients arrived, assembling charts in large plastic three-ring binders. I guess that means my interest in health information goes back to the very beginning (or maybe I just liked the smell of mimeograph ink). After a while, I tired of being the ice chip police and transferred to being the “checkout girl” at the gift shop. The computerized cash register made the job fun. I enjoyed the tally reports that it created for the end-of-day close. Maybe that’s where my interest in technology comes from. Cecilia and I thought it would be cool to work together when we grew up. I could have a private practice and she could be the office nurse. Although I did ultimately end up with that practice (at least for a while,) she specialized in cardiac nursing and prowled the telemetry and post-surgical step-down units. The hospital where we started faced a declining census and was torn down to make room for outpatient offices. I still have a brick from the demolition. Ironically, a decade later they’re thinking about building a bed tower there due to rising hospitalizations among the increasingly aged population of our home town. Being a nurse on the front lines, Cecilia really has seen the transformation of healthcare delivery first hand. She has nearly a decade more experience than I do, working in the trenches while I was still slogging through medical school and residency. She has worked through every buzzword you can think of. We always commiserate about having to deal with patient-focused care that’s actually profit-focused, centers of excellence that really aren’t that excellent (but the administrators think that if you call it that, it makes it automatically great,) and goofy regulations and policies. Spending time in major hospitals throughout the country, we’ve both found that the more hospitals think they’re unique, they more they really are the same. Clinical care has been commoditized. It’s a bit humorous, but we both wound up in the same situation for clinical work. Although she works for a major health system just a few miles from her home, they don’t employ her – she’s staffed by an agency hundreds of miles away because the hospital doesn’t want to spend the money to employ full-time nurses. I’m in the same boat because my hospital doesn’t actually employ any of the hospital-based physicians either, relying on a staffing company to insure us and administer our schedules. It’s a long way from what we thought we were getting into way back when. I can’t complain, though. Being a mercenary doc from the clinical perspective allows me to indulge my IT passions and still see patients. It does make one wonder, though,what’s next in healthcare. When the majority of workers at a hospital aren’t actually employed by the hospital, what’s that going to mean? How do you ensure training and consistency? How do you handle an ever-changing and increasingly complex environment? How does it impact patients? We’ll just have to wait and see. So here’s to The Holidays. I hope you have the chance to connect with friends and colleagues old and new. Stay safe, stay sane, and take some time to recharge. If what we’ve seen this year is true, it’s only going to get busier in 2012. Have a question about eggnog recipes, call light systems, or making the perfect ice pack out of a rubber glove and paper towels? E-mail me. Thanks for the great memories! 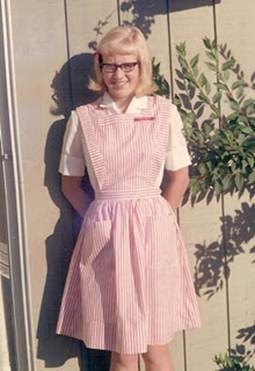 I too started my healthcare career as a Candy Striper and I still remember those days fondly. Doesn’t seem possible that it has been almost 40 years since I transported my first patient and delivered flowers to new mothers. If you are opposed to someone else shopping at midnite on Black Friday, of course you are the neighborhood grinch. Why should your preference obstruct their choice? I loved the candystriper memories. I’m also nostalgic for those days, when hospitals had a a tenderness–and maybe an innocence–that regulation, HIPAA, business needs and technology have removed. MrHIT oughtta digress a bit and let readers do some nostalgic pieces on pre- or early technology days.